The EDD-3701x EtherCAT slave drive joins Galil’s EtherCAT Family. This family has grown to include two EtherCAT masters and an I/O slave with both digital and analog I/O points. 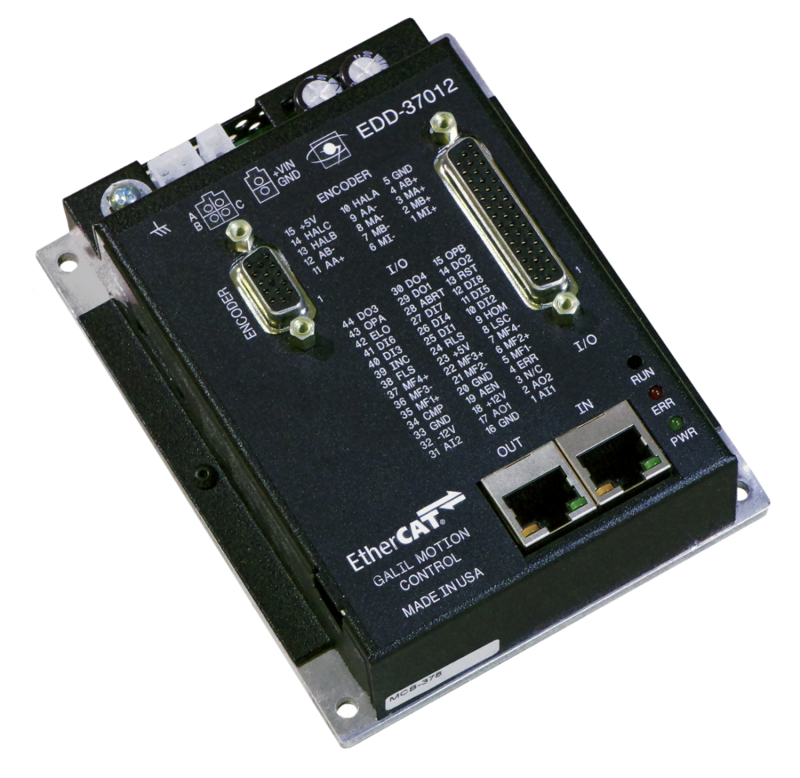 The EDD-3701x is a motor amplifier that operates in an EtherCAT distributed system where there are up to 32 slave drives and one master. It has a daisy chain topology using standard CAT5 Ethernet cables. The EDD-3701x can interface with Galil masters (DMC-500x0 and DMC-52xx0) for sophisticated applications or with TwinCAT® for very simple applications. The EDD-3701x series has the ability to control brushed, brushless, steppers, and microstepping motors (See Table 1 for more details). Unlike the competition, the EDD-3701x can both control a motor and also has 8 digital inputs, 4 digital outputs, 2 analog inputs, and 2 analog outputs. All I/O information from these drives are accessible by the EtherCAT master. This capability can eliminate the need for separate EtherCAT I/O devices. The configuration of the EDD-3701x is done using the Galil’s GDK software. Simply connect to a PC via EDD-3701x’s USB port, follow the GDK configuration tool process, and start moving motors. The EDD-3701x also comes with a setup guide to get the user from taking the EDD out of the box to moving motors in a manner of minutes. Table 1: EDD-3701x drive sepcifications. To command the EDD-3701x, Galil provides the DMC-52xx0 and DMC-500x0. The DMC-52xx0 is Galil’s pure EtherCAT controller that can interface with up to 32 axes of motion and 2 I/O slave devices. The DMC-50000 controls a combination of 8 local or EtherCAT axes. Both EtherCAT masters have onboard I/O with up to 8 digital inputs, 8 digital outputs, 8 analog inputs, and 8 analog outputs which can also eliminate the need for a separate I/O device. Each Galil EtherCAT masters can interface with slave drives in Cycle Synchronous Position mode (CSP) and the DMC-500x0 can also use Cycle Synchronous Torque mode (CST). Both masters have an EtherCAT port to communicate with EtherCAT drives and I/O devices, and an Ethernet and serial port for communication with the host PC. As with all of Galil’s products, the DMC-52xx0 and DMC-500x0 use Galil’s two-letter English like command language for both EtherCAT configuration and motion control execution. Galil offers the RIO-574x0 if the I/O on the Galil EtherCAT Master and/or the EDD-3701x is not sufficient for the application. It also provides flexibility if additional I/O is needed far from the DMC or EDD. The RIO-574x0 is Galil’s EtherCAT I/O slave with up to 16 digital inputs and 16 digital outputs. Unlike the competition, the RIO-574x0 also offers 8 analog inputs and 8 analog outputs. It has two EtherCAT ports and one micro USB port for configuration using a host. With the addition of the EDD-3701x Galil can now provide a complete EtherCAT solution for the most demanding applications. Contact a Galil Applications Engineer to learn more about what Galil’s EtherCAT Family can accomplish with your application. Email us at support@galil.com or give us a call at (916) 626-0101. Here are links to the EtherCAT Product Page and EDD-3701x Product Page.